Inspired by all of the elements of French design - from the regal yet comfortable antique, embroidered quilt to the intricate details painted on a bedroom dresser – acclaimed author Betty Lou Phillips takes a close look at the French ever-so-chic way with design in her book The French Way with Design. 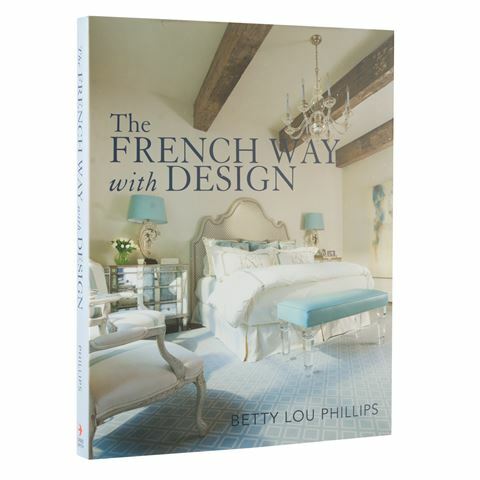 Featuring gorgeous, colourful photographs by American photographer Dan Piassick, The French Way with Design offers a mix of passion, panache, taste and resourcefulness, and opens the doors to apartments in Paris, chateaux in the Loire Valley, and bastides in Provence. Each photograph is accompanied with a detailed description, as well as handy tips for aspiring interior designers – providing readers with a taste for the kitchen and texture rules. There is also advice for fine dining, the art of exhibition and bed culture. It’s all finely-crafted wood pieces, splendid mirrors, lovingly cared for linens, but with a touch of modern sensibility. The French Way with Design - there’s luxury in each detail. Written by Betty Lou Phillips. Includes a lovely dust cover. Beautiful, full colour photographs by Dan Piassick. Each photograph is accompanied with a detailed description and handy tips. Dimensions: 26.5cm (w) x 34cm (h) x 2.5cm (d).